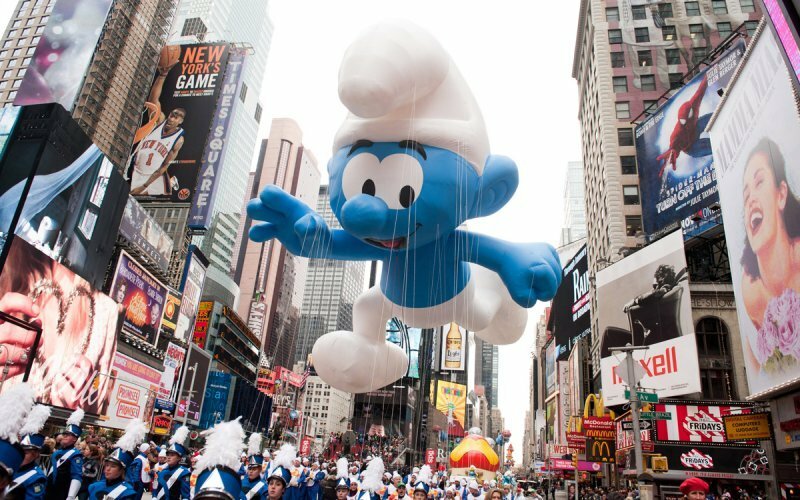 The Macy’s Thanksgiving Day Parade was first held in 1924 when was called the Macy’s Christmas Day Parade although it took place on Thanksgiving Day. In 1927, Macy’s introduces the world famous giant helium balloons. The first balloons included Felix the Cat and Toy Soldier. The balloons were redesigned and again released. Equipped with a return address label, Macy’s offered a prize for their return. In 1955, the parade telecast returns to NBC after a two year tune on CBS. In 1969 the Macy’s Parade Studio moves to its current home in Hoboken, New Jersey in a former Tootsie Roll factory. Dino the Dinosaur balloon was inducted into the American Museum of Natural History in 1975 as an honorary member. In 1977, the “Parade Lady” Jean McFaddin takes the helm of the parade, which she leads for the next 24 years. In the 1980s, the smaller “novelty” balloons were introduced, including the Macy’s stars and the 30 foot triple-scoop ice cream cone. “Falloons” were also introduced at this time. A combination of float and cold air balloon, this is a highlight of the creativity of the Macy’s Parade Studio. Macy’s is the world’s second largest consumer of helium. The US government is the first.